Meet Anna Bryant, a local painter/Montessori teacher/mother/wife/friend of mine. Currently, her exhibit, “Daily Feast”, is running at New Dominion Bookstore. I advise you to stop by when you’re downtown, but try to go after a meal; aside from their visual appeal, her paintings might stir up the munchies. 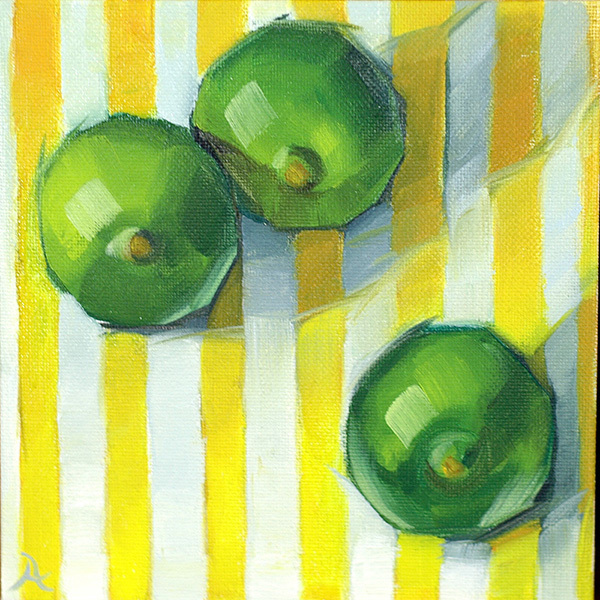 As the exhibit name implies, Anna’s pieces are 6″ x 6″ snapshots from the kitchen table, done in delightful colors applied with thick brush strokes. They’re part of an artistic exercise she embarked on recently–a commitment to to create one painting a day–and though my artistic genre is different from hers, I wanted to hear what she had to say about her endeavor. 1) Tell me a little bit about the project you undertook- how did the idea to paint one piece a day come to you? What was your objective with this exercise? I actually discovered daily painting while I was sick with lyme disease. During the time I usually spent painting in the studio, I was forced to rest instead. I still wanted to work on my painting skills even from the couch, so I began reading books on painting technique and color theory, looking at other artists’ blogs, and watching demonstrations online. I’ve never before given this much time to research, and it’s helped my work tremendously. This was when I stumbled upon an huge online community of daily painters. They work everyday, share what they’ve done with one another, and many of them have made great strides of personal progress. Carol Marine, one of my favorites, states that it takes about 500 paintings for an artist to fully develop their technique and style. That’s a lot of paintings! I love the idea of that challenge and I hope to continue this process to 500– I estimate I have about 300 to go! 2) Did you give yourself any parameters, other than producing one piece each day? What challenges does that process present? Another self-imposed restriction was to only use colors on the outside of the color wheel, so no semi neutrals like burnt umber or yellow ochre that a lot of artists rely heavily on. I’ve found I can control the color harmonies much better if I do all the mixing myself. I have also done some experimenting with controlled color schemes, my favorite of which is split-complementary. Setting up a still life this way requires a commitment to finding props that fit within these boundaries. The biggest challenge of all has absolutely been the time constraint. I work during my child’s nap which is about 3 hours long. Working alla prima (all at once) is a bit like a game of chess. You have to think through all your moves before you begin. What you do on the first layer affects everything afterwards. Each color or stroke plays a part in the way your eye moves around the painting, what parts you focus on, and what kind of feeling you are left with. So you have to think ahead and make decisions quickly and confidently or you won’t be able to finish. 3) What do you glean from this experience, both in terms of your craft and creating art in general? I’ve learned that I’m a lot more like a sprinter than a long-distance runner. I love the intensity required to complete a painting in one sitting, and the challenge is what keeps me engaged. When I painted over weeks and even months, I used to get bored and waste a lot of time. I would lose interest before I finished. I also learned that you can’t fix a bad beginning. If the drawing is off, you’d better wipe it and begin again– you can’t improve it mid-way. I think this creative approach, while it works well for small pieces, is relevant for large pieces as well. John Singer Sargent would practice sections of brushwork over and over before committing it to a larger canvas. Even after a day of working (from life!) if he didn’t have the sitter’s portrait just as he wanted, he’d wipe the canvas and begin again the next day. He was that committed to keeping the brushwork spontaneous, fresh and accurate. In reference to the creative process at large, I’d say this has taught me to invest in the process before the product. The act of beginning and finishing is so important, it should be practiced frequently, not just when the stakes are high and you’re attempting something ambitious.